At lease 500MB of free disk. Windows 7, Windows 8/8.1, Windows Vista or Windows XP. 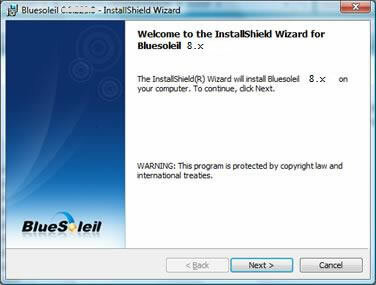 Uninstall the earlier version of BlueSoleil you installed on your computer: Click Start -> Control Panel to open Control Panel, and then choose Uninstall a program. Select BlueSoleil in the program list and uninstall it. Note: Bluetooth adapter can be remained plugged or unplugged during the installation. 2.2.1. Insert BlueSoleil installation CD into the CD-ROM. Note: You could also download the latest version on our website Download page and install it directly. 2.2.2. Double-click setup.exe to start installation. 2.2.3. Choose the setup language. 2.2.4. Follow the instructions on the screen. Note: If you do not restart, some operations may be abnormal. BlueSoleil can only be removed from Control Panel. For detailed instructions, please refer to "step 3.1 Before installing" in this guide. Double click "Bluetooth Places" icon on the desktop or right-click the Bluetooth icon in the system tray and select "Explore Bluetooth Places". Make the devices discoverable first. Double-click Search Devices icon and then Bluetooth devices will appear in the window. Double-click the device icon to enter the device's subfolder. Services supported by the device will appear in the window automatically. If not, double-click Search Services icon to refresh. You might be prompted to enter a passkey to authenticate. 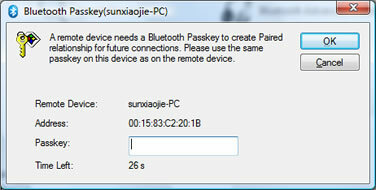 Enter the same passkey on both sides, or enter the specific one provided by the device manufacture on your computer side only. On BlueSoleil side, the dialog box as shown in the following picture will pop up for you to enter a passkey. Right-click the connecting remote service icon, and select Disconnect.